We want meaning. It is purpose in our work that we seek – because then our effort makes sense. You may work in an organizational culture, however, that doesn’t care about your purpose. The sole push for money pushes the soul out of any company. We can still thrive, however. (We must.) 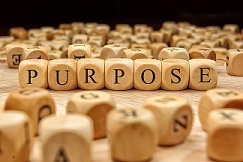 Besides, we know that it’s on us to bring purpose to our work, instead of waiting for our work or others to bring meaning to us. 1. Choose your experience. Last we checked, our focus, thoughts – and therefore our emotions – are still ours to choose. Being on purpose is not an intellectual exercise – it’s emotional. Therefore, ask yourself, “What’s the experience I want to have right now?” Heightened experiences lift us to possibilities previously unavailable to us. 2. Bring out the best in others. Do you know that one person on the team that, whenever you’re around them, elevates who you are? And your contributions grow? The best among us harbor a purpose that can’t be met unless value is brought to humanity, the collective. When interacting with a team member, choose behaviors that bring out their best. We bring meaning to our work when our efforts are meaningful to others. It may not look like it, but the next meeting on the calendar is the chance to bring greater purpose to our work.